Can Art plants are equipped with state of the art back to back extrusion presses. 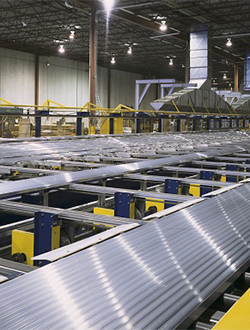 Our extrusion systems feature high tonnage PLC controlled presses, high efficiency billet ovens, infrared die ovens, high pressure PLC controlled quench systems, double pullers, gentle belt handling systems, computerized stretchers and automated in-line precision cutting. Orders can be interchanged between presses and even between plants if necessary, thus providing shorter lead times and assured source of supply. 1 x 1800 ton 7"
2 x 2500 ton 7"
2 x 2500 ton 8"
1 x 3600 ton 9"
Our profile weight capabilities range from under 0.100 lbs/ft up to 12 lbs/ft , with a maximum cut length of 35 ft. Longer lengths subject to inquiry. We extrude primary billet as well as LEED compliant recycled billet. Special recipes within the 6000 series are also available upon inquiry.